This statement is the second to be published by Seafood Holdings Ltd in accordance with section 54(1) of the Modern Slavery Act 2015. It sets out the steps taken during the year ending 30th June 2017 and builds upon the information provided in the first Modern Slavery Statement published for financial year 2015 - 2016. This statement outlines the ongoing work being conducted by Seafood Holdings Ltd to prevent modern slavery and human trafficking from occurring in its own business and its global supply chains. New research developed by the International Labour Organisation, the Walk Free Foundation and the International Office for Migration suggests that more than 40 million people around the world were victims of modern slavery in 2016¹ with almost 25 million of those victims exploited in forced labour, the most common element of modern slavery. The Modern Slavery Act 2015 (the “Act”) looks to tackle this international atrocity, by making large UK companies accountable for the workers in their supply chains, where modern slavery is often hidden. The Act requires companies to publish an annual report setting out the steps being taken to ensure that trafficked men, women and children are not entering their supply chain and to give details of any due diligence being conducted to ensure forced, bonded or slave labour is not being used for the benefit of such companies. Seafood Holdings Ltd has a zero-tolerance approach to conducting business with any individual or organisation who knowingly utilises any form of modern slavery. Seafood Holding Ltd is a wholesale supplier of fresh and frozen fish and seafood products serving customers in the food service and catering industry in the UK. We have 9 depots in England and Scotland which source, prepare and deliver products to professional kitchens. We have over 9,000 customers in the UK including Michelin starred restaurants, contract caterers, hotels, pubs, educational customers and sports stadiums. We had 744 employees at the end of our last financial year on 30th June 2017. Our annual turnover for the year was £144,229,857 (gross) and £135,582,787 (net). Our immediate parent company is Bidfresh Limited and our ultimate parent company is Bid Corporation Limited whose registered office is in South Africa. We buy our products for re-sale (the products we go on to sell to our customers) from approximately 400 direct suppliers (also known as "tier one" suppliers) and approximately 30 agents/brokers, who sit between us and further tier 1 suppliers. Our tier 1 suppliers are based in over 20 countries around the world including: the UK, Ireland, Norway, Iceland, Denmark, Holland, Switzerland, France, Turkey, Greece, Spain, Vietnam, China, India, Indonesia, Philippines, Thailand, Bangladesh, Taiwan, Canada, the USA and South Africa. Our supply chains range from being short and simple (where we are able to purchase fresh fish and seafood directly from local fishing vessels at local auctions) to very long and complex (where foreign fish and seafood species are imported from all around the world and undergo various levels of processing). There can be many tiers involved in the more complex supply chains. For example, fishermen/fishing trawler, fish auctions, fish markets, processing factories, producers, hatcheries, feed mills, other fish supply companies, importers, agents and brokers. This does make mapping the supply chains difficult, but in the globalised world of today this is unavoidable. Many fish and seafood species would otherwise not be available locally, as they are seasonal or are not native to the UK. To allow us to consistently supply top quality products at competitive prices, all year round, we require our supply chains to be, truly global. We actively respect workers' rights in our own business and promote this throughout our supply chains; we endeavor to ensure the abhorrent abuses of slavery and human trafficking are not ever tolerated. We have an Ethical Trading Policy which incorporates the 9 principals of the ETI’s Base Code and an Anti-Slavery and Human Trafficking Policy which reflects our commitment to acting ethically and with integrity in all our business relationships. These two policies help us to implement and enforce effective systems and controls to ensure that slavery and human trafficking are not taking place anywhere in our own business or supply chains. In our previous Modern Slavery Statement, we planned to draft terms and conditions for our suppliers, to ensure ethical best practice is contractually committed to by the tier 1 supply base. Clauses include: A duty to comply with the Act and our two policies aforementioned; a requirement to conduct regular ethical risk assessments of suppliers further down the chain; to implement due diligence controls to prevent modern slavery from occurring; to notify us immediately if any labour rights issues arise in the business or supply chains; and an explanation of our commitment to always work with, and support suppliers in correcting non-conformances. We are pleased to announce that we now have in place our ‘Anti-Slavery, Human Trafficking and Ethical Trading Agreement’ (the “Agreement”) that outlines the above. It also grants us permission to audit suppliers against our two policies, the Base Code and UK law. The Agreement has been signed by our key suppliers and we are continuing to ensure that all new (and existing) suppliers have received, signed and returned a copy. For smaller suppliers or those with whom we conduct only minimal business, we ask that, at a minimum, they sign their commitment to respect the ETI Base Code. For steps taken prior to 30th June 2016, please refer to our previous Modern Slavery Statement. In 2016, we continued the vertical supply chain mapping of our high risk products (prawns, squid and tuna). We also started mapping our cod and haddock supply chains, with a focus on frozen products coming from China. Where possible, we collated information on the supply chains right the way back to the fishing vessel, as we saw this point in the supply chain being the highest risk for potential slavery. Due to the complexity of seafood supply chains, this is an ongoing process and we will continue gathering and analysing information. As supply chains alter over time, we request that suppliers provide us updated information, should the supply chain change. The information is risk assessed using our Ethics in Seafood Risk Assessment Tool, as described in our previous Modern Slavery Statement. In December 2016, a training programme was designed and delivered internally to all depots’ technical managers. This was to aid our Ethical Analyst’s work on the new supplier compliance program, to commence in January 2017. An Ethical Trade & Labour Rights Self-Assessment Questionnaire (“SAQ”) was designed and sent to our tier 1 suppliers, as part of an ethical trade induction pack which also includes: an Introduction Letter; a PDF poster of the ETI’s Base Code to be placed in staff areas; our Anti-Slavery, Human Trafficking & Ethical Trading Agreement; our Ethical Trading Policy; our Anti-Slavery & Human Trafficking Policy; and a copy of the full, auditable ETI Base Code (with sub-clauses). In January 2017, our Modern Slavery training was delivered to our key staff and was incorporated into our induction training programme for new employees. In March 2017, our Director of Sustainability was invited to sit on a panel discussion at the ETI’s bi-annual roundtable meeting, to discuss what corporate leadership in modern slavery looks like. In April 2017, a new system and risk assessment process was established to analyse, track and monitor our tier 1 suppliers’ social compliance. In May 2017, our first ethical trade newsletter was sent out to our staff to be sent out periodically. Topics have included The ETI, Our Vision, Modern Slavery, Social Auditing, Child Labour and Working Together for a Fairer Future. In June 2017, we designed an internal audit programme, to enable us to conduct social audits of our suppliers whom we identified as high risk through their Ethical SAQ or third party audit analysis. Our social audits are based on the SMETA Best Practice Guidance, along with accompanying documents. It will ensure that all suppliers receiving an audit by us, will receive a full social audit report, along with any corrective action requests and timeframes for completion. • Aid us in providing appropriate remediation to workers who have not had their human rights upheld. To begin our due diligence process, we used the Food Network for Ethical Trade’s country risk ratings (along with annual spend) to give each supplier an initial rating of low, medium or high risk. Low risk suppliers are required to sign our aforementioned Agreement. Medium risk suppliers are required to sign the Agreement and complete our Ethical SAQ. High risk suppliers are required to sign the Agreement, complete our Ethical SAQ and provide a copy of a social audit report conducted within the last two years (or if this is not available, be willing to receive an internal audit from us). For a detailed explanation of our Ethics in Seafood Risk Assessment Tool, which focuses on locating potential risk hotspots in the supply chain, please refer to our previous Modern Slavery Statement. Where possible, we have continued to collect information on our product supply chains all the way back to the fishing vessel of the primary product, including: The flag state; the owner and licence details; the number of crew and their nationality; the time the vessel spends at sea; the use of transhipment and the port where the catch is landed. To compliment the work being done to map high risk supply chains vertically down through each tier, we decided to simultaneously gather more in-depth data on the workforces and policies of our tier 1 suppliers, to ensure ethical compliance at this more accessible level. Following the return of our SAQs, we therefore designed a second risk assessment tool, which considers: annual spend; site location; known industry risk; if they produce our “A Passion for Fish” brand; the complexity of the supply chain; the site’s own policies; their social audit programme; their social compliance management systems; the percentage of migrant labourers; the percentage of agency/contract workers; the reliance on seasonal/temporary staff; the right to freedom of association / collective bargaining; and on site accommodation. A system is now in place whereby all suppliers can be benchmarked on their social compliance and are given a risk rating based on the outcome of the SAQ and social audit report analysis. Following the risk assessment of our tier 1 suppliers, we have been able to reclassify the majority of our previously perceived medium or high risk suppliers, to low risk. Where suppliers remain medium or high risk, this is predominantly due to the fact that we have not received enough substantial evidence from the supplier that they are taking adequate steps to mitigate the possibility of modern slavery in the supply chain. This being said, we have identified no instances of modern slavery or human trafficking at any point, either in our own business or supply chains. In our 2015 - 2016 Modern Slavery Statement we identified key areas in our supply chains that we considered high risk. These were the use of transhipment and uncertified warm water prawns. We discussed the possibility of removing the practice of transhipment from our supply chains completely; this is a long term goal, but will be a complicated ongoing process to eliminate completely as it is highly prevalent in certain seafood supply chains. We identified that our tuna and squid supply chains were particularly susceptible to transhipment and have therefore been working on removing it from our tuna supply chains. We are now confident that transhipment is not being used in our tuna supply chains. Our squid supply chains are proving more difficult to tackle. We were unable to source squid for 2016 - 2017 with no use of transhipment, due to the species required by our customers and the seasonality of the product. We therefore conducted further due diligence on our current suppliers by requesting more detailed information on the crew on the fishing vessels. We received satisfactory responses and were given no reason to believe that anyone on the vessels was trapped in any form of modern slavery. The information we received included: assurances that there are no migrant labourers on the vessels, that the workers are all employed directly by the vessel owner (no agent/broker used) and the vessels are registered on the South Pacific Regional Fisheries Management Organisation authorised vessel list. In response to our tier 1 suppliers, who scored a high or medium risk rating following our risk assessment, we are designing some practical guidance for suppliers on how to implement the principals of the Base Code into their own business and supply chains and will be conducting random second-party audits to monitor compliance. As an ETI foundation member, we were required to deliver our first ETI report in January 2017, describing the measures we have taken to ensure that the ETI Base Code is respected right the way down our supply chains. Following a review of our report by the ETI and their NGO and TU members, they concluded that we had successfully completed all the requirements to be granted full ETI membership. However, due to our parent company (Bidfresh Limited) expanding its membership to cover other businesses within the group, our membership as an ETI foundation member shall continue until such time that the wider Bidfresh group is in a position to be granted full ETI membership. Our ethical trading staff are continuing to monitor and map our supply chains endeavouring to continually increase transparency. The results are reported and discussed at board meetings. We actively encourage all our suppliers to report any labour rights concerns to us openly and we encourage our staff to report any concerns they may have about slavery or human trafficking to our confidential ethics hotline which they may call anonymously, free of charge, 24 hours a day, 7 days a week. Posters of the helpline contact number are displayed around all of our depots and all key staff have received training on this. In January 2017, internal modern slavery training was delivered to everyone in the business. The training focussed on the issues of modern slavery in the seafood industry, our membership to the ETI, our Ethical Trading Policy and Anti-Slavery and Human Trafficking Policy and our due diligence programme. The training was initially delivered to all technical managers and was then rolled out to all key staff, including management, buyers, factory workers, office staff and cleaners. Modern slavery training has also been incorporated into our staff induction training and all key staff receive the monthly Ethical Trade Newsletter, to keep them informed and up to date on ethical issues. d) Plan, conduct, report and follow-up a social systems audit in accordance with ISO 19011 and by interpreting the requirements of SA8000 and/or the ETI Base Code. Detailed below are the further steps that we identified in our previous Modern Slavery Statement to try and ensure that there is no slavery or human trafficking in our own business or our supply chains along with the updated position, as at 30th June 2017, to demonstrate our progress. 1. Begin to instruct an independent auditor to carry out physical audits (as opposed to paper audits) of our high risk tier one suppliers against key performance indicators. Ethical Analyst successfully completed an SGS Social Systems Auditor Training programme to enable us to carry out audits rather than outsourcing this. We have designed a Bidfresh audit programme for the group, to commence in summer 2017. 2. Start carrying out internal physical audits of our own business relating to modern slavery, human trafficking and ethical trade in general. We are considering our internal contracts & Staff Handbook and changes/updates are planned for the next edition to better protect workers. We have not conducted any physical social audits of our own sites as yet. 3. Draft standard terms and conditions for our suppliers to agree to which incorporate clauses on ethical trade such as duties to comply with the Act (where applicable), conduct regular risk assessments within their own supply chains, implement controls to prevent modern slavery and notify us immediately if any issues arise in their supply chains. We can then take action if any supplier breaches these obligations which may include terminating the contract with that supplier. We now have our ‘Anti-Slavery, Human Trafficking and Ethical Trading Agreement’ and these was sent to key suppliers prior to 30th June 2017 and will be sent to all suppliers in 2017 - 2018. 4. We have developed some internal modern slavery and human trafficking training which will be rolled out to all our key members of staff. Over 600 of our employees have been trained as at 30th June 2017 and this is now a part of our induction training. There was a delay in training at one of our sites due to unforeseeable circumstances, but this took place in August 2017. 5. Improve information flow generally to our staff members about ethical trade issues. We were originally using the company’s intranet to keep staff informed about ethical trade, but since this stopped being in place in May 2017, we established a newsletter that is sent to our employees periodically regarding modern slavery and ethical trade. 6. Continue to work with the ETI and build relationships and collaborate with other ETI members as modern slavery and human trafficking is a growing global issue which cannot be tackled by us alone. We continued attendance at ETI and SECLG roundtables, building relationships with other ETI members. 7. Identify our top 10 high risk suppliers to build a closer relationship with and have meaningful discussions to promote the treatment of workers. We met our main shrimp supplier and discussed our invite to visit a shrimp farm. All key suppliers have completed our ethical SAQ and increased contact regarding ethical policies and procedures / sharing of the ETI’s vulnerable worker toolkit and a guide for small businesses on how to implement ethical trade into their business. 8. Purchase more products which have been certified by independent third parties such as the Global Aquaculture Alliance, the Aquaculture Stewardship Culture and Global Gap. Our Central Purchasing Department are now moving towards sourcing only BAP 4* prawns and once this has been achieved we intend to push this to all our buyers across our depots. 9. Start streamlining our supply chains by ordering more products from fewer suppliers to develop stronger long-term relationships and increase our leverage with certain suppliers. Work is on-going in our Central Purchasing Department starting with frozen products. Once a streamlined list of frozen suppliers is agreed all our buyers will need to adhere to it. 10. Adopt a purchasing strategy called “choice-architecture” to educate our customers and encourage them towards ethical best practice through limiting their choices of fish and seafood purchases in high risk areas. This has started to happen through our purchase of certified products but also through our brochure on ethical trade which was designed to raise customer awareness, share our knowledge and educate our customers into making more ethical choices. 3. Conduct physical audits of high risk suppliers who do not have a valid third party social audit from within the last two years. This statement has been published In accordance with section 54(1) of the Modern Slavery Act 2015. It sets out the steps taken by Seafood Holdings Limited during the year ending 30th June 2016 to prevent modern slavery and human trafficking in its business and supply chains. The International Labour Organization ("ILO") estimates that almost 21 million people worldwide are victims of forced labour; almost 19 million of those victims are exploited by private individuals or enterprises, generating US$ 150 billion of illegal profit per year¹. In response to this atrocity, the United Kingdom Modern Slavery Act 2015 requires large companies to publish an annual report setting out what, if any, steps they take to ensure that slavery and human trafficking is not taking place in any of their supply chains or their own businesses². We have a zero tolerance approach to modern slavery and human trafficking within our own operations and supply chains. 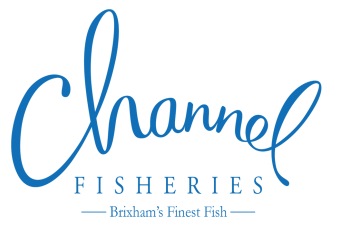 We are a wholesale supplier of fresh and frozen fish and seafood products serving customers in the food service and catering industry in the UK. We have 9 depots in England and Scotland which source, prepare and deliver products to professional kitchens. We have over 9,000 customers in the UK including Michelin starred restaurants, contract caterers, hotels, pubs, educational customers and sports stadiums. We had 719 employees at the end of our last financial year on 30th June 2016. Our annual turnover for the year ending 30th June 2016 was £138,182,062 (gross) and £129,877,262 (net). Our immediate parent company is Bidfresh Limited and our ultimate parent company is Bid Corporation Limited whose registered office is in South Africa. Our supply chains range from being extremely short (where we purchase fresh fish and seafood directly from local fishing vessels at local auctions) to more complex (where foreign fish and seafood species are imported from all around the world). There can be many tiers involved in the more complex supply chains. For example, fishermen/fishing trawler, fish auctions, fish markets, processing factories, hatcheries, feed mills and other fish supply companies and producers. We buy products from approximately 500 direct suppliers (also known as "tier one" suppliers) and agents, based in 17 countries around the world such as the UK, Norway, Switzerland, France, Turkey, Iceland, Holland, Spain, Vietnam, China, India, Indonesia, Philippines, Canada, Taiwan, Bangladesh and South Africa. This is to ensure that we are able to consistently supply top quality products at competitive prices, all year round, which may not be available locally as many fish and seafood products are seasonal. We respect workers' rights in our own business and throughout our supply chains, with a primary focus on the abhorrent abuses of slavery and human trafficking. We have an Ethical Trading Policy and an Anti-Slavery and Human Trafficking Policy which reflect our commitment to acting ethically and with integrity in all our business relationships. These policies help us to implement and enforce effective systems and controls to ensure that slavery and human trafficking are not taking place anywhere in our own business or supply chains. In 2013, we joined the Advisory Board of the Responsible Fishing Scheme which aims to build a new responsible fishing scheme internationally which now covers ethical issues as part of its scope. In 2014, we joined the Seafish Common Language Group Ethical Committee which is a forum set up to examine issues around social and ethical trade in the seafood industry. In December 2014, we also joined the Ethical Trading Initiative ("the ETI") as a Foundation Member. The ETI is a leading alliance of companies, trade unions and non-government organisations ("NGOs") that promotes respect for workers' rights around the globe. This enables us to be able to work collaboratively in pioneering positive change for workers' rights in the seafood industry, on both a local and a global level. We share the ETI's vision which is a world where all workers are free from exploitation and discrimination and enjoy conditions of freedom, security and equity. 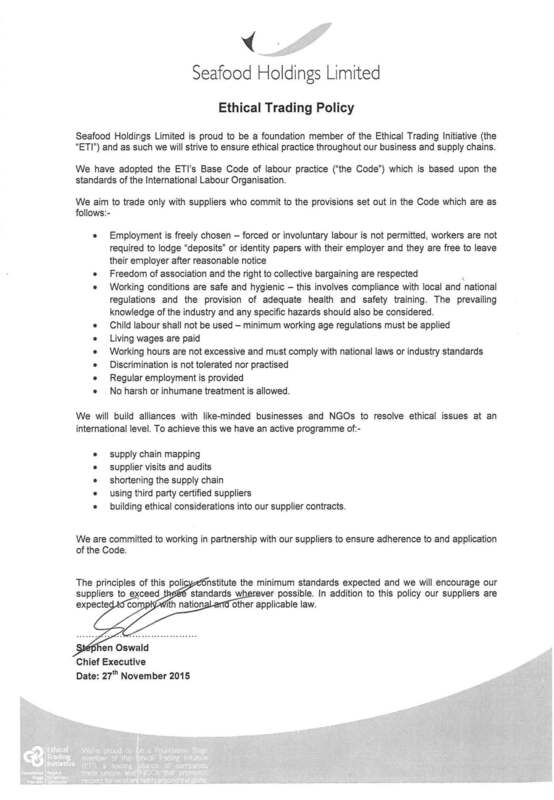 We therefore incorporated the ETI Base Code into our own Ethical Trading Policy and have adopted this as our minimum requirement for working conditions within our supply chains and have requested our suppliers to commit to these important basic principles. In 2015, we announced on our website that we had become a Foundation Member of the ETI and we placed ETI posters around our depots to make our staff and any anyone who comes to our depots aware of our commitment to the ETI and its principles. We also joined the Thai Seafood Working Group, organised by the ETI, to investigate the farmed prawn industry in Thailand, a well-known and reported high risk area, to learn more about the issue and to discuss the best way to tackle the problem. Further, the ETI's Chief Executive attended one of our board meetings to present to our board of directors on what the ETI stands for and how we can utilise our ETI membership to combat slavery and human trafficking. In April 2016, we employed a Supply Chain Analyst to start mapping our supply chains as we anticipate that our supply chains are where our biggest exposure to modern slavery and human trafficking are. We also instructed an external consultant to help us with the mapping task and to develop a risk assessment tool. Our primary focus was to concentrate on high risk areas first that could require further investigation. Mapping the supply chains is a lengthy and complex project for certain fish species and in particular geographical areas. Our aims are to create complete transparency and encourage honest and open information sharing so that we obtain sufficient details for every level of our supply chains, from the fishers catching our fish to the farmers producing our prawns. In May 2016, we started mapping our supply chains for prawns, squid and tuna. However, due to the complicated supply chains within the seafood industry we are still gathering and analysing information. This will be a permanently ongoing process because our supply chains alter over time. The next species we intend to focus on are cod and haddock. Our slavery and human trafficking due diligence framework is based on the UN Guiding Principles on Business and Human Rights, which emphasises the responsibility of businesses to respect human rights in their own operations and business relationships. Furthermore, it uses the ETI's Human Rights Due Diligence Framework which provides specific guidance on what suppliers in food supply chains can do to address the particular risks to vulnerable workers in their operations and supply chains. Having this framework helps us to: create transparency in our supply chains; identify actual and potential risk of modern slavery and human trafficking in our own business and that of our supply chains; identify our leverage to mitigate these risks through strengthening relationships with key suppliers and ultimately aid us in providing appropriate remediation to workers who have not had their human rights upheld. Our Ethics in Seafood Risk Assessment Tool assesses the risk of modern slavery and human trafficking based on publicly available data in particular high risk geographical locations. We used a combination of the Corruption Perception Index ("CPI"); an index which reviews each country and rates how transparent the data they provide is, and a study commissioned by Seafish (written by Roger Plant, 2015³) which assess the ethical issues impacting on seafood species landed into and imported to the UK. The investigation covered 15 major countries supplying fish and seafood to the UK market, and concluded with a high, medium or low risk indicator for workers in the seafood industry of that country, both on and off shore. This study, along with the CPI, created the basis for the geography risk assessment component of our tool, enabling us to give each supplier we assessed a country score between 1 and 5; 1 being the highest risk and 5 the lowest risk. The risk assessment then considers factors to mitigate these country level risks, based on internationally recognised standards, which change according to the type of business being assessed. Using information based on the ILO's standard conventions and the ETI Base Code, we then consider the mitigating evidence based on audits with a direct social and welfare focus. This section of the risk assessment is given a double weighting, considerably decreasing the risk where an acceptable social audit report is available and considerably increasing the risk, should no information on social welfare be provided. When considering risk factors for assessing vessels in wild capture supply chains, we again turned to internationally recognised standards, utilising Seafish's Responsible Fishing Scheme, ISSF Proactive Vessel Registration and the Illegal, Unregulated and Unreported fishing database, again rating each vessel on a 1-5 risk scale. The occurrence of transhipment is also taken into consideration; being a notoriously high risk activity for the potential exploitation of fishers, the use of transhipment means that the fishing vessel scores a high risk rating of 1. Each tier in the supply chain is independently risk assessed against the aforementioned assurances, relevant to the type of business. The score is then added up and calculated on a pro rata basis against the number of assurances it has been scored against. Based on the overall numerical score, it is then given a risk rating of high risk (red), medium risk (amber), or low risk (green). The information we ascertained from our Ethics in Seafood Risk Assessment Tool has been translated into a visual supply chain map, in order to gain greater insight into where high risk links are commonly appearing. From this detailed analysis of perceived high risk products, we have been able to reclassify the majority of analysed supply chains as either medium or low risk, due to substantial evidence mitigating the perceived risks. However, some fish and seafood products we supply do still present a high risk of potential modern slavery and human trafficking; primarily as a result of little or no mitigating evidence being provided by the suppliers to reassure us otherwise. Key areas in our supply chains have therefore been highlighted as high priority for further investigation. These include shrimp farms in India where little regulation exists in an industry that has had an overwhelming ten-fold growth between 1980 and 2010⁴ and squid being caught by China's distant water fishing industry; where the transhipment of catch suggests that fisherman remain out at sea for prolonged periods of time, increasing the potential for exploitation. The root cause of the risks identified above are industry wide and cannot be dealt with by us alone, but need further industry wide collaboration. Where it is apparent that countries rely on slave labour in the seafood industry, in order to create competitively priced products to sell to a globalised market, the most vulnerable people in societies are being systematically exploited. Our active and passionate participation in multi-stakeholder initiatives like the ETI and the Seafood Ethics Common Language Group ("SECLG"), allows us to be involved in reform seeking at the political level and fosters opportunities to openly share the information and experiences we have gained across an international platform. Moreover, through our membership of the aforementioned groups, we are able to benefit and learn from key industry experts and novel initiatives taking place globally. Our aim is that through demanding complete transparency from our suppliers and by providing them with the knowledge and training they require (where appropriate) we can ensure that the abhorrent practices of modern slavery are not tolerated at any level of our supply chains. We are committed to helping suppliers remediate certain situations where their treatment of workers has fallen below the minimum standards that we expect. For example, where excessive hours are being worked or where workers are not being provided with a rest break. In those circumstances, we would seek to educate and train the supplier and then undertake further monitoring. We will only walk away from a supplier as a last resort if no improvement has been shown where we have detected a problem and taken steps to try and get the supplier to meet our minimum standards. However, for the most serious cases of slavery (such as where workers have had their passports confiscated and are forced to work for no pay in terrible conditions) we would immediately stop purchasing products from such a supplier. Such abuses are too serious to tolerate. We appreciate that we hold more power to ensure workers' rights are protected when we are in a commercial relationship with a supplier but there is a line that can be crossed where we must step away and terminate a supply contract. It is a question of degree and we will consider each situation carefully to determine the most appropriate response that is required. Our ethical trading staff are continuing to monitor and map our supply chains endeavouring to continually increase the transparency we have on all suppliers in the chain. The results are reported and discussed at board meetings. As an ETI Foundation Member, we are required to deliver a report after our initial 24 months of membership (and thereafter on an annual basis), describing the measures we have taken to further the ETI base Code in combatting modern slavery and human trafficking. We encourage our staff to report any concerns they may about slavery or human trafficking to our confidential ethics hotline which they may call anonymously, free of charge, 24 hours a day, 7 days a week. • Workshop on Social Licence to Operate (Seafish). 10. Adopt a purchasing strategy called "choice-architecture" to educate our customers and encourage them towards ethical best practice through limiting their choices of fish and seafood purchases in high risk areas. This statement was approved by the board of Seafood Holdings Limited.